Full instructions for applying your stencil can be found here. 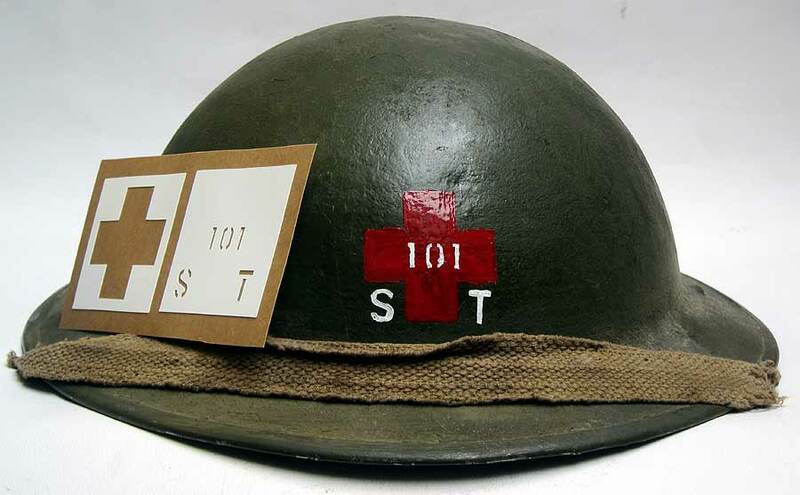 Many of the WW2 American Helmet Stencils can also be adapted and used on WW1 helmets. You can view these here. We can make up pretty much any stencil you want, just email us and ask. US WWI 26th Infantry Division 103d Infantry Helmet Stencil "Pine Tree State"
This stencil will allow you to paint the 'Pine Tree' of the 103'd Infantry Regiment from the 26th Infantry Division. The 103rd Infantry Regiment was an infantry regiment of the United States Army that served in combat in the American Civil War, World War I, and World War II. It was an Army National Guard regiment from the states making up New England, but most of its soldiers came from Maine (The Pine Tree State). It was a part of the 26th Infantry Division and the 43rd Infantry Division. This stencil will allow you to paint three different battalions and 5 companies within each battalion using one stencil. The 80th Inf Div usually wore the Battalion insignia to the front of the helmet and the Divisional marking to the rear. The picture to the left shows the HQ company of the 313'd Machine Gun Battalion. See instructions for more details. There were many variations of each of these helmet markings. 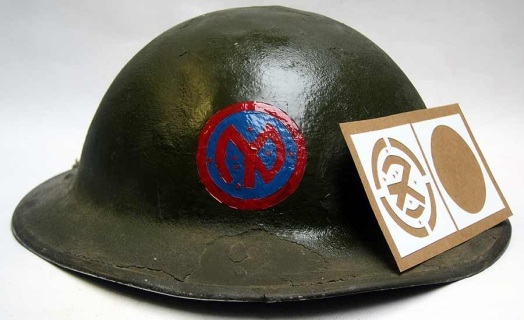 This division served in WW1, WW2 and recent conflicts, This stencil is reusable and can be used on WW1 helmets, where various different combinations of stencil were used. This stencil has been deliberately made to look hand painted with the bottom two star points missing. It has been taken from an original helmet. If you want the full star its easy just go to our stencil instructions page. 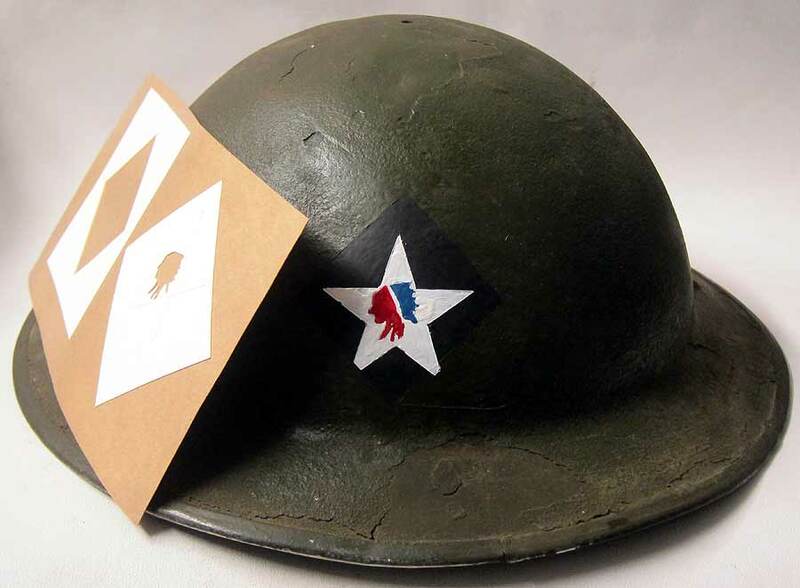 The 77th Infantry Division was the first American division composed of draftees to arrive in France in World War I, landing in April 1918. The division fought in the Battle of Château-Thierry on 18 July 1918. It sustained 10,194 casualties 1,486 killed and 8,708 wounded. The "Lost Battalion" of World War I fame was composed of six companies of the 77th's 308th Infantry Regiment and one from the 307th Infantry Regiment. 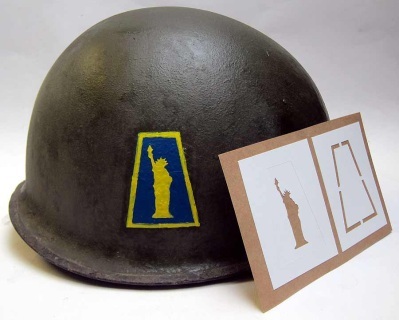 The helmet shown is a WW2 M1 but the stencil is identical but placed on the front of the brodie or doughboy helmet and without the yellow border. 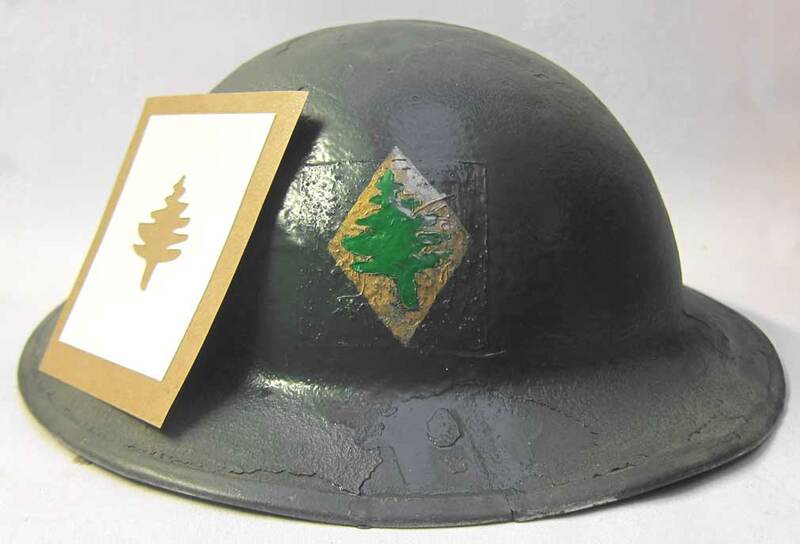 The 26th Infantry Division was formed in 1917 consisting of units from the New England area, the division's commander selected the nickname "Yankee Division" to highlight the division's geographic makeup. Sent to Europe in World War I as part of the American Expeditionary Force, the division saw extensive combat in France. There were numerous variations of this stencil. This stencil will allow you to make up several different variations and like all our stencils is reusable. A Sanitary Train unit was usually a temporary assignment before they arrived at their destination unit. After arrival they would be assigned to a Field Hospital. 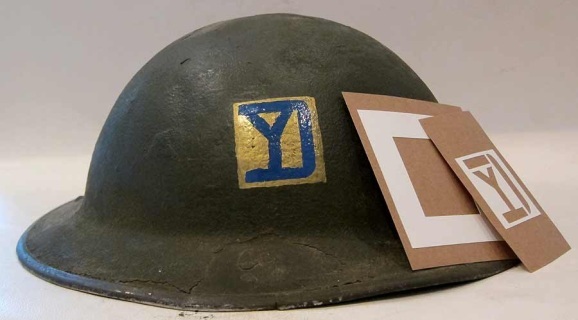 This unit was part of the 26th Infantry 'Yankee Division' division in WW1. WW1 27th Infantry Division - "Orion" the Commander of the Division John F. O'Ryan. 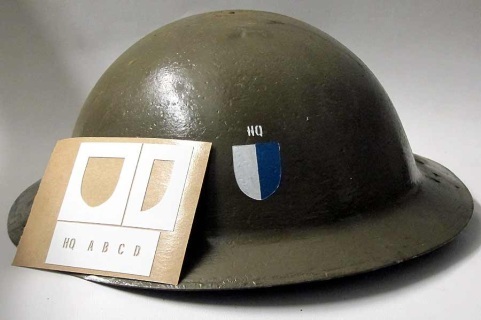 The 27th Infantry Division was a unit of the Army National Guard in World War I. The Division traces its history from the 6th Division, made up of New York units and formed in May 1917. The 6th Division designation was changed to the 27th Division in July 1917. The 27th broke the Hindenburg line during the Battle of the Somme and forced a German retreat from their defensive line and forced the Germans to a final confrontation at the Selle River. The Armistice ended the fighting and the division was sent home in February 1919.